Have you decided that the ketogenic diet is for you? Do you want to lose weight while eating and living healthily? 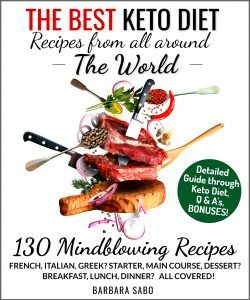 Do you want a range of tasty recipes so that you can maintain your keto diet until you achieve your goals? – Tools for your keto adventure such as yes/no Food List, 56 Commonly Used Sugar Substitute, Adult Beverages Nutrition List, Meat Nutrition List, Tips for Getting over on Keto-Flu and so on. – The 21 day Keto Challenge: 21 days of Keto Specific Goal to Prepare You to Lose Weight and Live Healthy. – Recipes for Starters and Breakfasts, for example, Asian Egg Drop Soup, Polish Breakfast with Kielbasa, Spanish Grilled Shrimp. – Main courses – Lunches and Dinners such as American Buffalo Chicken Meatballs, Chinese Pad Thai, German Meatloaf with Boiled Egg, Japanese Beef Teriyaki with Sesame and Kale, Italian Chicken Saltimbocca. – Side Dishes like Indian Naan Bread, Italian Cheese and Bacon Bread, Italian Fathead Gnocchi, Spanish Tortilla. – Desserts and Snacks like Italian Pignoli Cookies, Irish Cinnamon Apple Crumb Cake, British Pumpkin Chocolate Marbled Cheesecake. – Smoothies, Shakes and Adult Beverages like Avocado Smoothie with Coconut Milk, Ginger and Turmeric, Chai Pumpkin Smoothie, Rasberry and Avocado Smoothie. This book is free from 04/04/2019 until 05/08/2019. Barbara Sabo is the author behind The Best Keto Diet recipes from all around the World. She lives as a full and healthy life in Ireland and she is a passionate advocate for the ketogenic diet and the health benefits of the low-carb lifestyle. Most of her recipes were inspired by her travels, recipes from all over the world – from Italy, Greece, Spain, Portugal, Asia, Thailand, India, etc. Her areas of expertise include recipe development and medically restricted diets. Her keto approach is worldwide cuisine, with full of fresh, clean, nutrient-dense fats, proteins and vegetables AND 100% FREE of processed foods and artificial ingredients. Are you tired of diets that never seem to work? Well the solution is here. Smart Primal Fitness: An Introduction To Paleo is a beginners guide into the world of Paleo. Learn how this dietary movement started and how it evolved to its present form. Not only does this book teach you the basics of the Paleo Diet but it also includes a 7 day meal plan with recipes to help you get started. Inside you will see the history of the Paleo Diet. How easy it is to start, and most importantly how easy it is to find your foods ingredients. This book is not filled with weird recipes, and hard to find ingredients. On the contrary it has the information you need to start the Paleo Diet with ingredients found in any local supermarket. We made it that easy. Don’t hesitate and start your Paleo Diet by reading Smart Primal Fitness: An Introduction To Paleo.